I updated this post to highlight Wendy’s incredible jams and Jenna’s refreshing Cantaloupe Salad. 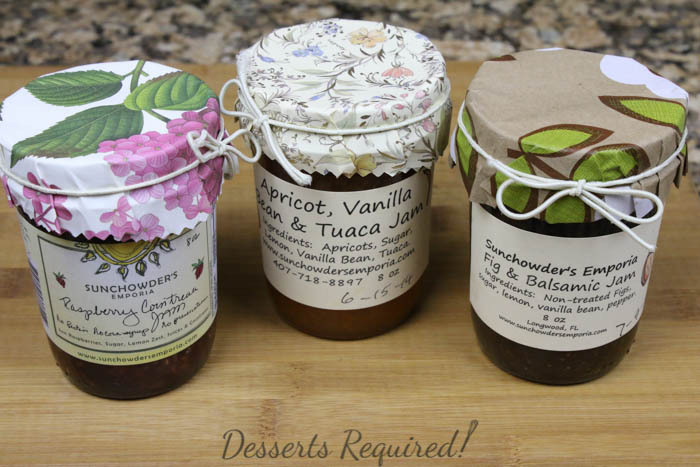 Wendy has graciously offered a 10% discount on her jams through September 15, 2015. Please read all about it and take advantage of this delectable deal! Not too long ago I wrote about my wonderful experience at the Food & Wine Conference. I highlighted some of the weekend’s top moments but did not mention a delicious new jam that I tried. Wendy Read’s business is Sunchowder’s Emporia where she hand makes some of the best jams I have ever had the pleasure of tasting. Shoshana and I both fell in love with the flavors we tried in our friend Jenni’s hotel room and I, immediately, ordered Wendy’s Raspberry Cointreau Jam, Fig and Balsamic Jam and Fresh Apricot and Vanilla Bean Tuaca Jam. Tuaca is a liqueur. Shoshana and I made a batch of Nana’s Butter Cookies using the three jams and they were fantastic. I, then, found myself taking spoonfuls of peanut butter and dolloping spoonsfuls of Fresh Apricot and Vanilla Bean Tuaca Jam on top. I could not stop eating this incredible jam. I posted comments about this addiction online and a few people mentioned how delicious it would be in a cocktail. Who was I not to give it a try? I zested a lime, squeezed its juice, added the Fresh Apricot and Vanilla Bean Tuaca Jam, tequila and simple syrup and ended up with one of the most amazing drinks I have ever tried. In my first round of the Sunshine Margarita I chose to shake in the shaker. I happen to love a bit of texture in a drink but know many others prefer a smooth beverage so I then gave all of the ingredients a spin in my mini-prep food processor. Whichever way you go, you won’t go wrong! Wendy sells her jams through Etsy but you better hurry because once apricot season ends, we have to wait a full year to buy more Fresh Apricot and Vanilla Beach Tuaca Jam. However, in the meantime, there are many other tasty jams from which to choose. As a special offer to Desserts Required readers, Wendy is offering a 10% discount on all orders placed through September 15, 2015. Enter code JUSTFORYOU when checking out to receive your discount. I am very excited to take advantage of this offer. This post is my way of showing Wendy how much I enjoyed her jams. As many of you know, I am a huge believer in supporting local businesses, whenever possible. I was not paid for this post nor did I receive merchandise in exchange for it. This is what I call a ‘paying it forward with sweetness’ blog post. I chose the name Sunshine Margarita because Wendy is all about the beauty of the sun as you can tell in her video and company name, Sunchowder’s Emporia. So, cheers Wendy and I hope you love this Sunshine Margarita as much as I love your jams! 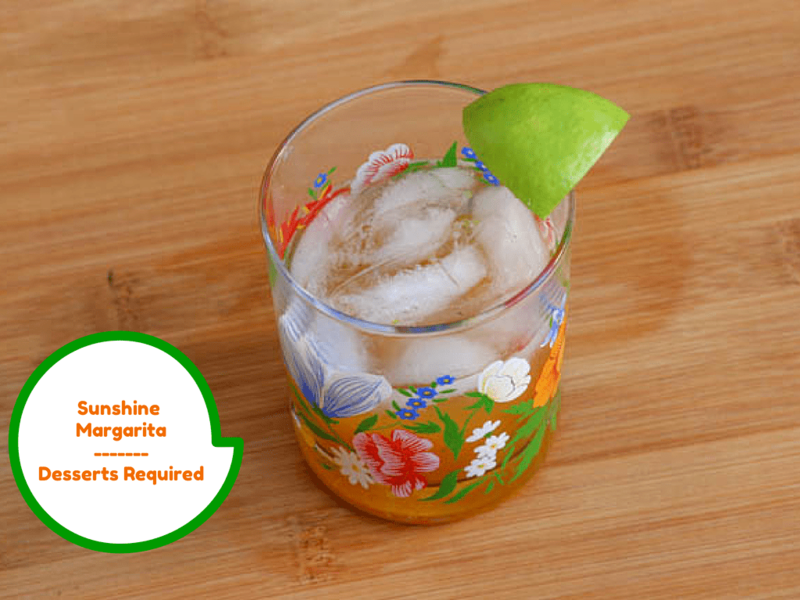 Combine the zest, juice of 1 lime, jam, tequila and simple syrup into a cocktail shaker. Shake and pour over a glass filled with ice cubes. If you prefer a smooth consistency, puree the drink in a blender or food processor. Simple syrup can be made by bringing ¾ cup water and ¾ cup sugar to a boil. Stir until the sugar is dissolved. Cool completely. Sunchowder’s Emporia Apricot Vanilla Bean Tuaca Jam may be bought on sunchowdersemporia.com. Additional time will be needed to make the simple syrup. 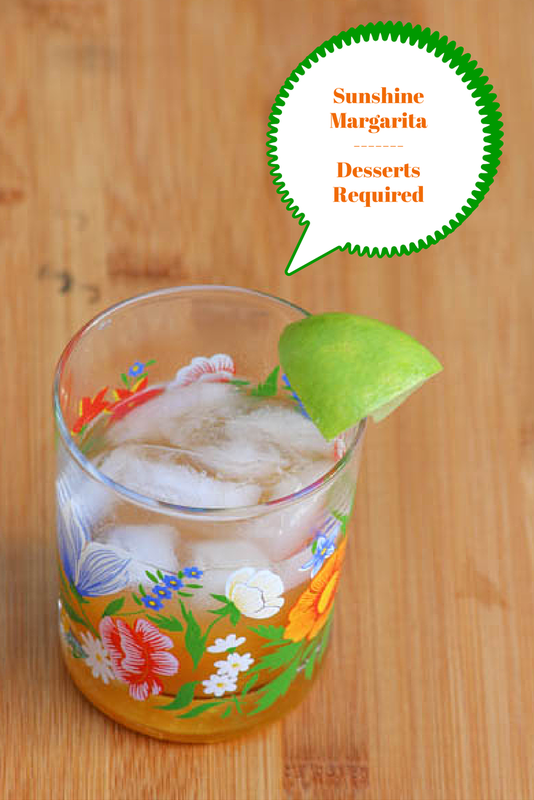 Looking for something perfect to accompany your Sunshine Margarita? 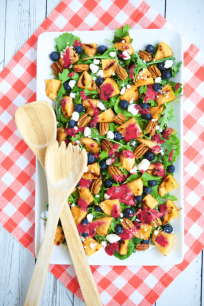 Try this lovely Canteloupe Salad from Jenna at Make Healthy Easy! There is nothing like a really really good jam. You taste the fruit and not just colored sweet trying to convince you that it’s made from fruit. I love the name and the way you use jam in this margarita. Ingenious. Thanks so very much. I was so impressed with Wendy’s jams when I tried them at the Food & Wine Conference. You can taste the love she puts into each jar. I hope you are able to take advantage of the 10% off! Cool beans, Betsy! I didn’t get to taste it at the conference (wah….where was I?) but I have just ordered 3 jars using your discount code. Stay tuned for raving! You made my day!!! I am so excited and know you are going to LOVE Wendy’s jams!! Can’t wait to hear the singing from CA! Very cool using jam in a cocktail, Betsy! This cocktail and the jam both sound delicious! Thanks so much. I am so impressed with the versatility of these jams. Cocktails, sandwiches, on a spoon….they all make me very happy!